Hailed ‘a feast of dancing’ by The Sunday Times, the English National Ballet’s Le Corsaire ia a classic story ballet. The ENB is the only UK company to perform this ballet, and the production returns to the Coliseum following wonderful performances in 2016. The audience are whisked away to a faraway land where they meet the dashing pirate, Conrad, and his feisty girlfriend Medora. The pair have many adventures together, including outfoxing villainous schemers. But will they find happiness on the high seas? This swashbuckling romp will see thrilling dancing, beautiful scenery, and costumes created by Hollywood’s Bob Ringwood (Batman). The romantic score will be plays by the English National Ballet Philharmonic, and the production will be staged by Anna-Marie Holmes. Holmes received an Emmy award for her staging of Le Corsaire in America, where it was filmed for the show PBS Great Performances. Le Corsaire has captivated audiences worldwide, including in cities such as Tokyo and Paris, and the show has received rave reviews. Don’t miss out on this swashbuckling storybook adventure! 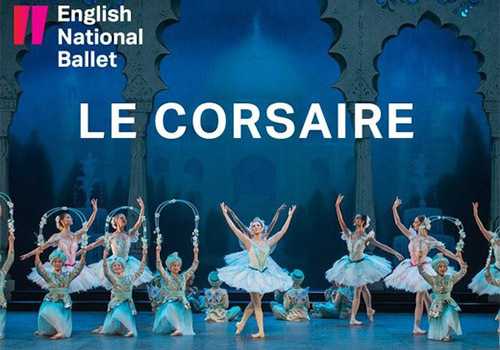 Le Corsaire runs at the London Coliseum from the 8th-14th January 2020. Le Corsaire is suitable for the whole family.